XY Mike Zhou (b.1994), aka. 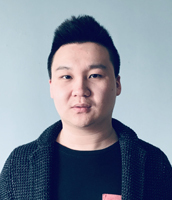 Xiangyu Zhou, is a NYC/Boston based composer currently pursuing a Graduate Diploma in Composition at the New England Conservatory(NEC), where he studies with Michael Gandolfi. Born in Beijing and raised in New York, Zhou studied saxophone with Ken Radnofsky at NEC and gained interest in composing during undergraduate years before shifting his major to composition for graduate studies. Recent events include a residency at the 2018 Atlantic Music Festival, an award from AN ART ARTISTRY (Greece), a commission from NEC’s 2019 Piano Prelude Project, and a commission&residency at the 2019 soundSCAPE festival (Italy). Past degrees include a Bachelor of Music in Saxophone Performance and a Masters of Music in Composition, both from New England Conservatory with academic honors. Previous composition teachers include John Mallia and Dan Bar-Hava, along with additional saxophone studies with Paul Cohen at Manhattan School of Music. Emily Joy Sullivan (b. 1987) is a composer, educator, and choral director based in Buffalo, New York. Her music is characterized by rhythmic drive and lush expressivity, and is deeply influenced by folk, pop, and world music. Ms. Sullivan’s works have been performed in New York, Chicago, Vancouver, Valencia, and Cape Town, South Africa. Ms. Sullivan recently received a Master’s degree in Music Composition at SUNY Fredonia, where she studied with Rob Deemer, Paul Coleman, and Jamie Leigh Sampson. She holds a BA in Music from Amherst College, where her feminist musicology thesis was “Envoicing Eve: Femmes Fatales in Carmen, Salome, and Lulu.” This fall, she will begin her Ph.D. in Music Theory and Composition at the University of California, Davis. She is currently working on a musical theater project retelling fairy tales from the heroines’ points of view. Paul Novak (b. 1998) writes music that is lyrical but fragmented, exploring the subtleties of instrumental color and drawing influence from literature, art, and poetry. He has been selected as the recipient of numerous national awards, most recently from the Webster University Competition, Frost Competition, Texas Young Composer’s Competition, Tribeca New Music, Young Composer’s Challenge, and YoungArts Foundation, and has participated in festivals including the first-ever Composer Apprenticeship with NYO-USA, Bowdoin Festival, fresh inc festival, Atlantic Music Festival, BUTI, and more. Novak’s works have been performed and read by ensembles including the Austin Symphony, Orlando Symphony, Reno Philharmonic, NYO-USA, NODUS Ensemble, So Percussion, Ensemble Ibis, Face the Music, and Worcester Chamber Music Society. Originally from Reno, NV, Novak is an undergraduate student at Rice University’s Shepherd School of Music, where he has studied with Pierre Jalbert, Anthony Brandt, and Karim Al-Zand.